...Pennsylvania is already notorious for having essentially put all of its barbers out of business due to excessive regulations, licensing requirements, and registration fees. From requiring 1,250 hours of barber class to $845 worth of various licensing fees, it’s not hard to see why barbers are an endangered species in the commonwealth. The next profession that they’ve targeted is pet groomers. ...Legislators are mulling over a bill that was proposed by Representative Bernard O’Neill which would have a striking resemblance to the laws of haircutting. A pet bather/brusher would need 80 hours of training (it takes an equivalent of eight hours a day for two weeks to learn how to bathe and brush a pet? ), an all-breed groomer would need 300 hours of training, and an all-breed master teacher/groomer (is this like the Mr. Miyagi of pet care?) would need 600 hours of training—not to mention the ability to wax on and wax off. If the bill passes, Pennsylvania will be the first in the nation to require licensing of pet groomers. ...The essence of this bill is one with which it would be difficult to disagree. As of now, there aren’t any requirements on groomers, and as such anyone and their brother would be able to open shop and call themselves a pet groomer. Such a situation increases the possibility of accidents and, for lack of a better term, malpractice. ...If this bill passes in its current form, however, Pennsylvania legislators—many of whom are the same corrupt legislators that voted themselves illegal pay raises in a late-night session last summer by calling the raises “unvouchered expenses”—will regulate a profession that goes from having no requirements to excessive requirements virtually overnight. It’s estimated that the schooling for such classes might cost a groomer over $100,000, no doubt causing severe economic hardship for a profession that can have an average salary around $25,000. ...An even bigger concern is that the lawmakers have proposed establishing a nine-member industry regulation board that would be comprised of five groomers, two politicians, and two members of the public at large. Call me whacky, but if these politicians are proposing this bill under the guise of safety, how safe is it to have a board of overseers on which almost 50 percent has little, if any, knowledge of the field which is being regulated? ...One of the bill’s co-sponsors, Representative Doug Reichley, was happy to see the possibility of more state supervision of something, saying, “The time may have come that this may be one more field that we may want to bring under this scope of review,” but a more appropriate view would be one that supports reasonable requirements and input from more people who actually know something about the field which they’re regulating. i am hopeful—perhaps naively so—that such legislation would not also apply to beavers. why are these pennsylvanian legislators just pussyfooting around the real issue: just raise taxes if you want more money instead of legislating businesses out of existence. I think the Pennslyvania legislature needs to pass a bill stating Doug Reichley can't use the word "may" more than twice in one sentence. Get a thesaurus Doug! I suppose this is more productive than legilatures looking into steroid use in baseball, but not by much. 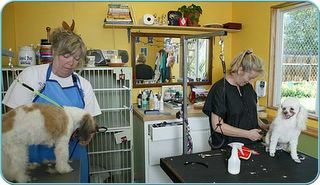 Are insufficiently trained pet groomers REALLY a threat to our way of life? Do these folks have nothing better to do with their time? I mean, really? DL, don’t say that because you’ve just given a few Pennsylvania legislators an idea for both the “personal hygiene privilege tax” and a way to cut down on accidents via home grooming. Representatives O’Neill and Reichley can co-author the bill that will require classroom instruction, licensure fees, and a board of regulators comprised of spa/salon workers, two members of the public, and both O’Neill and Reichley. O’Neill and Reichley can be the two guys who make the final decision as to whether or not each beaver has been groomed properly. You know, like quality control. When it comes to taxes, though, many Pennsylvania legislators are probably afraid of angering anymore constituents than have already been angered following the pay-raise scam (to their credit, both O’Neill and Reichley voted ‘no’ on it); most would sooner hide behind the “we’re saving cute little animals” idea. Several incumbents are quite worried and a few have already said that they’re not going to bother running for re-election. My local representative has been quite arrogant about the whole situation, refusing to comment about the raise itself, but willing to tell everyone about how wonderful he is when he’s asked questions about competition in the upcoming election. Calvin, I may say that you may be onto something with which I may agree. What we’ll need to have is a hearing where five or six groomers are called to testify before a panel in Harrisburg; one groomer will be toting a new book which alleges that the other groomers were grooming while using performance-enhancing shears; one groomer will say that she never, ever used performance-enhancing shears but will later be found to have them in her possession; one groomer will refuse to answer any questions, saying, “I’m here to talk about the future of pet grooming—not the past”; the other groomers will simply explain that illegal shears might or might not be used across the commonwealth, but they’re not really sure. Amy, absolutely nothing. This is how they’re earning my money.